Magical Uses and History: "April showers bring May flowers..." The tulip is often one of the first flowers to pop up in the spring, especially in April and May. They convey a message of hope and mark a fresh start. Because of their variety of colors and shape, tulips were probably one of the first flowers grown solely for their beauty. Tulip designs on pottery date back as far as 2200 to 1600 B.C. and have been found on fabric from the Byzantine century. There is little European history of the tulip until the early 1500's when European explorers and traders were introduced to the flower by the Turkish sultans. From then on, tulips spread across Europe, particularly Holland where they were prized and later became the national symbol, sometimes costing more than gems and gold. In the early 1700's the Turkish government outlawed the sale of tulip bulbs outside of the capital city to manage the outrageous and inflated costs of the bulbs across Europe. Tulips are most commonly referred to as the symbol of perfect love. The Turks used them in love potions or placed them on altars during love spells. They can be used to increase desire and build relationships, both new and old. Furthermore, tulips are also used in flower language. Red is a declaration of love, yellow hopeless love, and black meant a heart burning with love. 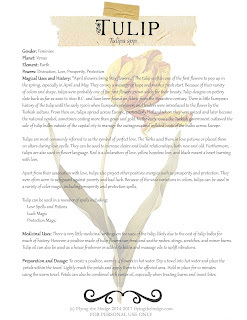 Apart from their association with love, tulips also project other positives energies such as prosperity and protection. They were often worn to safeguard against poverty and bad luck. Because of the wide variations in colors, tulips can be used in a variety of color magic, including prosperity and protection spells. Medicinal Uses: There is very little medicinal writings on the uses of the tulip, likely due to the cost of tulip bulbs for much of history. However, a poultice made of tulip flowers can treat and soothe rashes, stings, scratches, and minor burns. Tulip oil can also be used as a house freshener or added to baths and massage oils to uplift vibrations. Preparation and Dosage: To create a poultice, warm 2-4 flowers in hot water. Dip a towel into hot water and place the petals within the towel. Lightly crush the petals and apply them to the affected area. Hold in place for 10 minutes using the warm towel. Petals can also be combined with castor oil, especially when treating burns and insect bites.